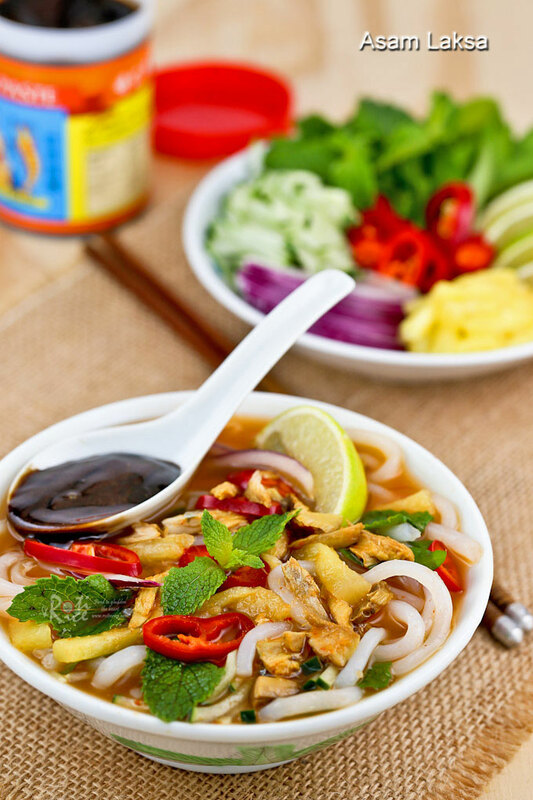 Asam Laksa is a flavorful, tangy, and spicy Malaysian fish based rice noodle soup. It is a dish not to be missed when visiting Malaysia. 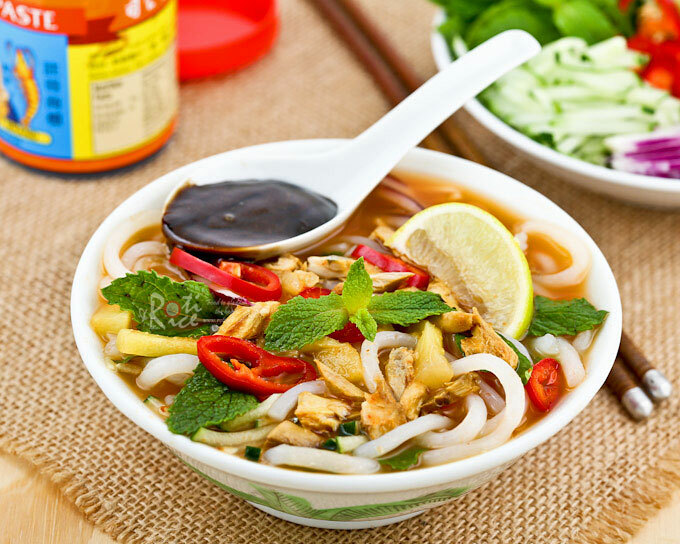 Asam Laksa is one of the most popular noodle dishes in Malaysia. It is synonymous to the island of Penang and an all-time favorite there. 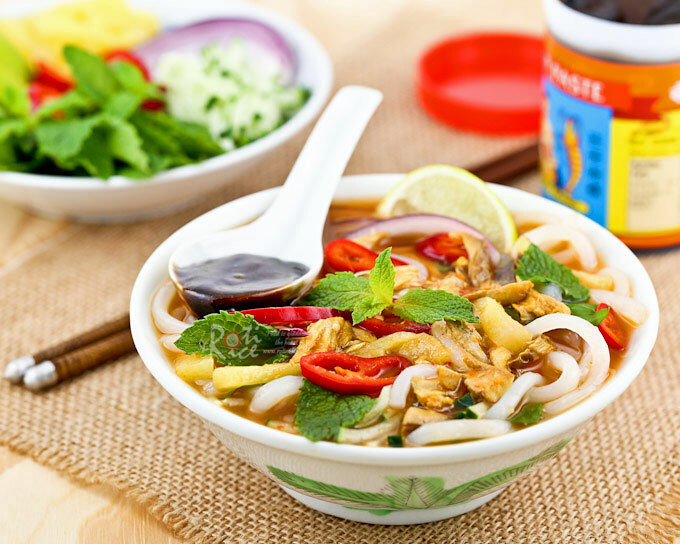 This flavorful, spicy, and tangy rice noodle soup hits all the right notes and is a must-taste when you visit. Despite the long list of ingredients, Asam Laksa is not difficult to make. Over here in the Midwest, gathering the ingredients is the most challenging part. I had to run to a few Asian grocery stores but thankfully I managed to get all the ingredients except two – asam gelugor (dried tamarind skin) and bunga kantan (torch ginger). The asam gelugor you see here is from my bounty hauled over the miles during visits to my parents home in Malaysia. However, this can easily be “fixed” (substituted) with tamarind paste, tamarind extract or lime juice. There is no substitute for torch ginger. Since it is a garnish, it may be omitted. In Malaysia, ikan kembung (chubb mackerel) is the most popular fish used in Asam Laksa. If I remember correctly, sometimes Mom will use ikan parang/sai toh yee (wolf herring) instead. Wolf herring makes the soup very tasty but since it is a bony fish peeling it can be very time consuming. Over here, I am thankful I can find yellowtail mackerel. For the tangy element of the soup, both asam jawa (tamarind paste) and asam gelugor are used. I was pleasantly surprised to find asam jawa in my local Asian market. The asam gelugor (dried tamarind skin) tree is native to the rainforest of Malaysia. Its bright yellow orange fruit is sliced and dried for use in providing tanginess to curries and soups. Asam gelugor may be substituted with lime juice or omitted altogether if more tamarind juice is used. Fortunately, a very important ingredient, daun kesom (polygonum) can be found in most Vietnamese markets. These fragrant leaves are also known as Vietnamese coriander or mint (rau ram in Vietnamese). The noodles used in Asam Laksa is fresh lai fun (thick rice noodles) or dried thick rice noodle sticks. The fresh Vietnamese noodles found in the Vietnamese market is very similar in texture to lai fun but it does appear to be a little more translucent. When I was a kid, mom used dried thick rice noodle sticks very similar to the one seen in the picture below. I found this Ming River Brand Tung Kow rice vermicelli that worked beautifully. 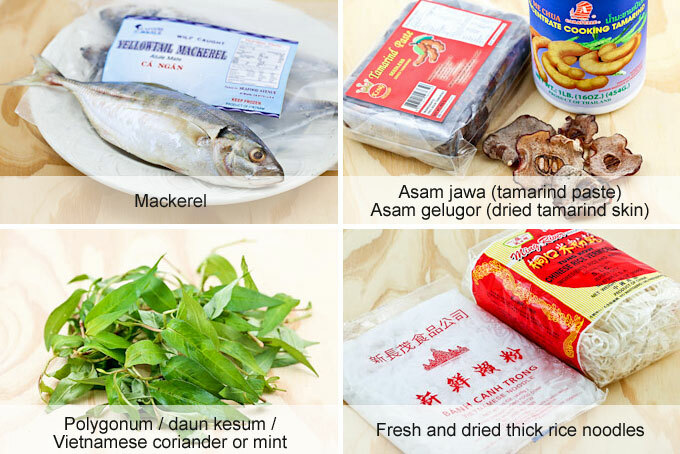 There are two kinds of shrimp paste listed in the recipe. The one on the left in the picture below is hei ko (sweet shrimp paste) used as a condiment or in sauces. It has a molasses-like consistency and need not be cooked. Hei ko is an essential ingredient in Rojak (Malaysian Spicy Fruit Salad) and Asam Laksa. I found this jar of hei ko in Minneapolis. Belacan as pictured on the right, must be cooked and cannot be eaten raw. Always buy the best grade you can afford as a little goes a long way. Belacan is used in making curry paste and dishes like Kangkung Belacan. This raw shrimp paste can be purchased at some of the Asian markets. They range in color from dull purplish pink to dark chocolate. 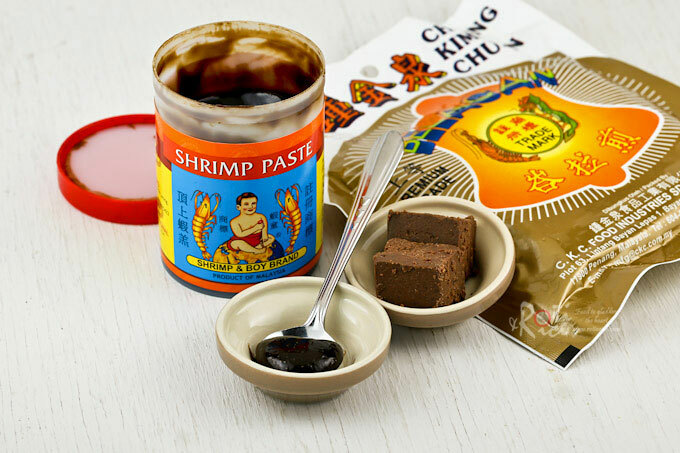 Here in the Midwest, you will most likely find Thai shrimp paste known as kapi. This post contains affiliate links. Please read my disclosure policy here. Blend spice paste ingredients with ¼ cup (60ml) water. Transfer to a bowl. Rinse asam jawa. Place in a bowl with 1 cup (240ml) hot water. Stir to dissolve some of the pulp then strain for the juice. Discard pulp. Bring 8 cups (2 liters) water in a large pot to a boil. Add ikan kembung (mackerel), lower heat to medium low and simmer for 15 minutes. Remove fish when cooked. Strain liquid with a metal strainer. You should get about 6 cups (1.5 liters) fish stock. Add tamarind juice, blended spice paste, asam gelugor, and daun kesum into pot with fish stock. Bring to a boil, lower heat, and allow it to simmer while you prepare the fish. When fish is cool enough to handle, remove bones and flake the meat. Break into small pieces but keep some in bigger chunks. Return flaked fish to the pot. Season the soup with sugar and salt. Cook noodles in boiling water for 1 to 2 minutes. Remove and strain. Place some noodles in a bowl. Top with a little julienned cucumber, pineapple, onion, red chili, mint leaves, and bunga kantan (torch ginger). Pour gravy over the noodles. Serve immediately with hei ko (shrimp paste) and lime wedges. **If tamarind paste is not available, 1 to 2 teaspoon (depending on taste) tamarind concentrate may be used instead. ***Dried thick vermicelli should be cooked in boiling water for a minute. Then turn off heat and let it soak for 6 to 8 minutes until soften. Remove and drain before serving. Savor this spicy, tangy, and flavorful Asam Laksa with a generous spoonful of hei ko (sweet shrimp paste). This dish is one many homesick Malaysians crave for. I hope you enjoy it just as much. In my Curry Laksa post, I mentioned another laksa known as Siamese Laksa or Laksa Lemak (not to be confused with the curry laksa found in Kuala Lumpur which is also sometimes known as laksa lemak). This is like a hybrid, if you will of Asam Laksa and Curry Laksa. 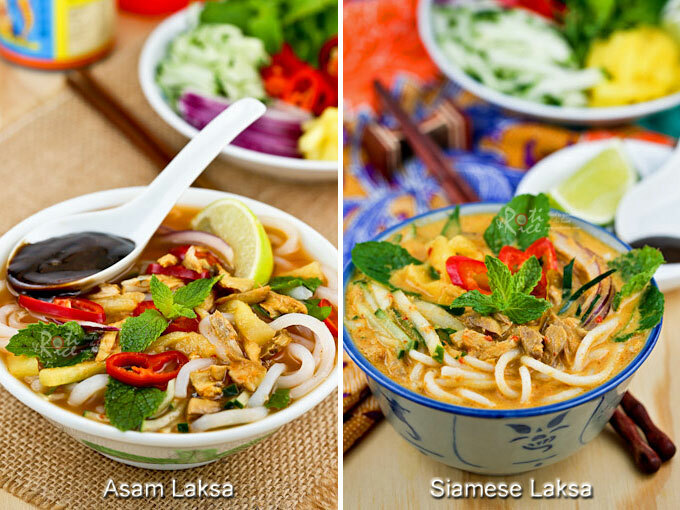 To my knowledge as far as Malaysia is concerned, Siamese Laksa is only found on the island of Penang. Curry Laksa is my favorite and this Siamese Laksa is a close second. Be sure to keep a lookout for the recipe coming up soon, here on the blog. I remember having asam laksa when travelling in Kaula Lumpur, I definitely have never made it myself before though. I must try the recipe, thanks for sharing it! I always look forward to your recipes. It is really great that you show pictures of the ingredients and the whole process is listed in such a methodical manner. It makes following your recipes easier for me (one who doesn’t cook much). This Assam Laksa looks so delicious. One day I will attempt to make it. Thank you very much. I can certainly see how getting all your ingredients could be challenging. When I was in college in a small town in Oregon I could not get anything and my mother had to mail me curry powder etc… Looks like a really hearty and tasty soup.